Check out the links to breastfeeding history articles on Kellymom.com. Thanks to Debra Swank, an IBCLC in Ashburn, VA for posting these Time Magazine articles on a lactation email list. The author explores the history of breastfeeding in America. Popular belief is that medicine, science, and the formula industry have had the most impact on women's decisions to bottle versus breastfeed. What cannot be overlooked are other areas of influence. Cultural practices, including the beliefs of colonial Americans, the increased social value of children in the 20th century, and the emergence of a middle class, have influenced maternal decision making. The first and second waves of feminism affected women's choices. Politics and religion have had multiple and varied influences. It is this author's position that culture, gender, politics, and religion, as well as medicine, science, and industry, have combined to affect feeding choices. All of these influences, as well as others, both unforeseen and unpredictable, will continue to affect the future of breastfeeding in our society. J Hum Lact. 25(1):85-94. "As we do not for a moment wish to be thought an advocate for an artificial, in preference to the natural course of rearing children, we beg our renders to understand us perfectly on this head; all we desire to prove is the fact that a child can be brought up as well on a spoon dietary as the best example to be found of those reared on the breast; having more strength, indeed, from the more nutritious food on which it lives. It will be thus less liable to infectious diseases, and more capable of resisting the virulence of any danger that may attack it; and without in any way depreciating the nutriment of its natural food, we wish to impress on the mother's mind that there are many cases of infantine debility which might eventuate in rickets, curvature of the spine, or mesenteric disease, where the addition to, or total substitution of, an artificial and more stimulating aliment, would not only give tone and strength to the constitution, but at the same time render the employment of mechanical means totally unnecessary. And, finally, though we would never—where the mother had the strength to suckle her child—supersede the breast, we would insist on making it a rule to accustom the child as early as possible to the use of an artificial diet, not only that it may acquire more vigour to help it over the ills of childhood, but that, in the absence of the mother, it might not miss the maternal sustenance; and also for the parent's sake, that, should the milk, from any cause, become vitiated, or suddenly cease, the child can be made over to the bottle and the spoon without the slightest apprehension of hurtful consequences." Two thousand years of medical advice on breastfeeding: comparison of Chinese and western texts. Department of Pediatrics, University of Chicago, Wyler Children's Hospital, IL 60637. This discussion introduces only a few aspects of the historical writings on breastfeeding in the two cultures. Chinese writings seem to be closer in orientation to modern worldwide medical advice, approaching breastfeeding from a more natural and supportive perspective. Ancient and not-so-ancient western medical advice on breastfeeding often implies the inadequacy of the mother to breastfeed her own infant, especially in the early weeks of life. One can only speculate as to what the historical basis for this may be. European medicine emphasizes the testing of milk for its adequacy. Again, the scientific basis for this is not evident. Modern clinical science finds that the milk of virtually all mothers, even those suffering from significant malnutrition, is adequate for the growth and development of the infant. This focus on the "testing" of milk may represent an early example of the reliance on laboratory diagnosis that has so heavily dominated western medicine in recent years. Finally, western medicine seems more managerial with regard to breastfeeding than Chinese medicine, and has perhaps "medicalized" breastfeeding, a compliant often voiced even now in late 20th century America. Nonetheless, both literatures demonstrate that throughout the history of recorded medicine, physicians have been concerned with promoting optimal breastfeeding and have understood the importance of human milk for the survival, growth, and development of the infant. PIP: Chinese and Western pediatric scholarship is compared based on published textbook material over the past 2000 years. 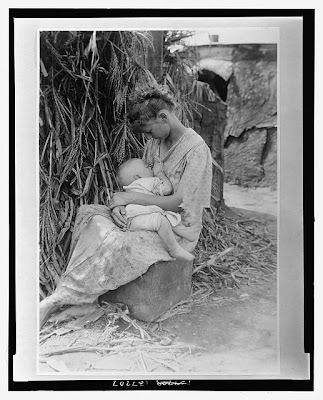 Modern, late 20th century teachings on breastfeeding are organized around the concept that breastfeeding is a natural, biological behavior that should be initiated immediately after birth and the belief that human milk is almost always the perfect food for the infant, even when the mother is less than adequately nourished or is suffering from some disease. In contrast, ancient and not so ancient Western medical advice on breastfeeding often implies the inadequacy of the mother to breastfeed her own infant, especially in the early weeks of life. This concept continues unquestioned through 1700 years of European medical advice on breastfeeding. One the other hand, William Cadogan's advice in 1750 is remarkably similar to that of the 12th century Chinese physician: absence of medical intervention and a natural and rapid onset of nursing by the biological mother. Chinese writings seem to be closer in orientation to modern worldwide medical advice, approaching breastfeeding from a more natural and supportive perspective. The ancient Chinese medical texts, but not the early European texts, address the origins of human milk. A Chinese work by Sun Simiao (581 to 682) of the Tang Dynasty describes human milk as the product of vital energies. On the initiation of breastfeeding, a 12th century Chinese writing sounds remarkably similar to the advice one would give today to a mother who had just delivered a child. However, Chinese physicians are not without their concepts of bad milk. They describe types of milk that they associate with the induction of various diseases in nurslings. Finally, Western medicine seems more managerial with regard to breastfeeding than Chinese medicine, and has perhaps medicalized breastfeeding. Throughout the 2000 years, both literatures express concern that substitutes for human milk are being used too early and too often. A great wrap up of news stories by Tanya at Motherwear Breastfeeding Blog. I am a wife and mother with a dietitian's conscience and very little time to blog these days. I love Jesus with all my might and I am totally dependent on His.